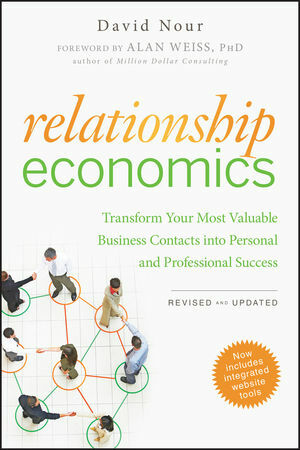 Relationship Economics isn't about taking advantage of friends or coworkers to get ahead. It's about prioritizing and maximizing a unique return on strategic relationships to fuel unprecedented growth. Based on the author's global speaking and consulting engagements, Relationship Economics reveals that success comes from investing in people for extraordinary returns. This revised and updated version explains the three major types of relationships—personal, functional, and strategic—and how to focus each to fuel enterprise growth. It introduces new concepts in relationship management, including the exchange of Relationship Currency, the accumulation of Reputation Capital, and the building of Professional Net Worth. These are the fundamental measures of business relationship, and once you understand them, you'll be able to turn your contacts into better executions, performance, and results. "David Nour is the definitive expert on strategic relationships. He has captured practical, pragmatic, and timely insights in Relationship Economics and has been a valuable resource to my sales transformation efforts." "Although many understand the importance of relationships, the quantifiable and strategic values of relationships are often underemphasized. David Nour has done just that in¿Relationship Economics." "If a man is judged by the company he keeps, David Nour's Relationship Economics provides a systematic approach to building value in that judgment. The concepts reach well beyond networking to building lasting and productive relationships." —DENNIS SADLOWSKI, former president and CEO, Siemens Energy & Automation, Inc.
David Nour is the thought leader on Relationship Economics—the quantifiable value of business relationships. As CEO of The Nour Group, Inc., he works with global clients in driving unprecedented growth through unique return on their strategic relationships. David has pioneered the phenomenon that relationships are the greatest off-balance-sheet asset any organization possesses—large or small, public or private. He has been featured in various publications, including the Wall Street Journal, the New York Times, and Forbes Small Business. To learn more, visit www.RelationshipEconomics.net. 1 Why Most "Networking" Doesn't Work! 2 The Evolution of Quantifiable Relationships. 4 Understanding the Science of Social Network Analysis (SNA). 5 Relationship-Centric Goals for Revenue Growth. 6 Pivotal Contacts for Leadership Development. 7 Relationship Bank for Strategy Execution. 8 Relationship Currency for Adaptive Innovation. 9 Transforming Us and Them into We. 10 Social Media and Business Relationships.